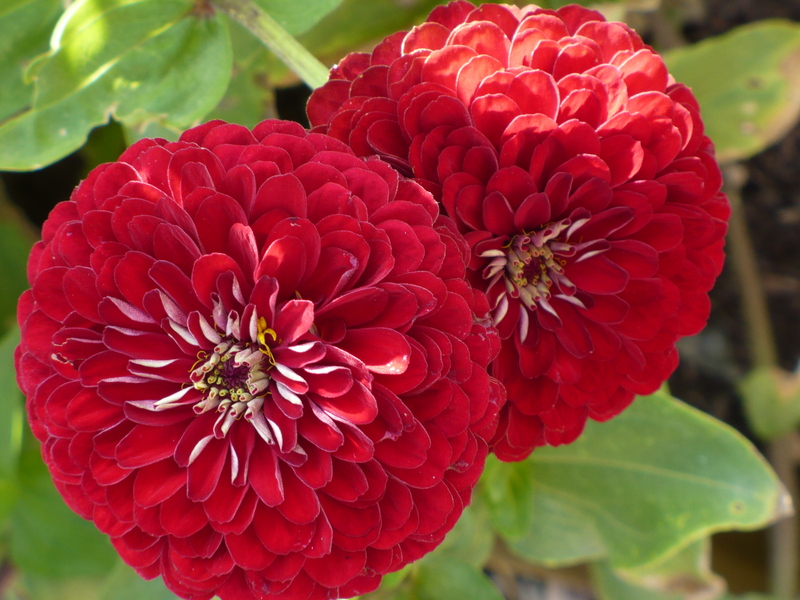 As August is turning to September, gardening can turn from something enjoyable into a chore. I have to admit that even I get Gardeners Fatigue at some point. At this point, it is far easier to just let that tomato plant die, rather than use heroic measures to keep it alive. This is the point I have reached with the Squash in our Family of 4 Garden. Yes, it would be great to get some squash. 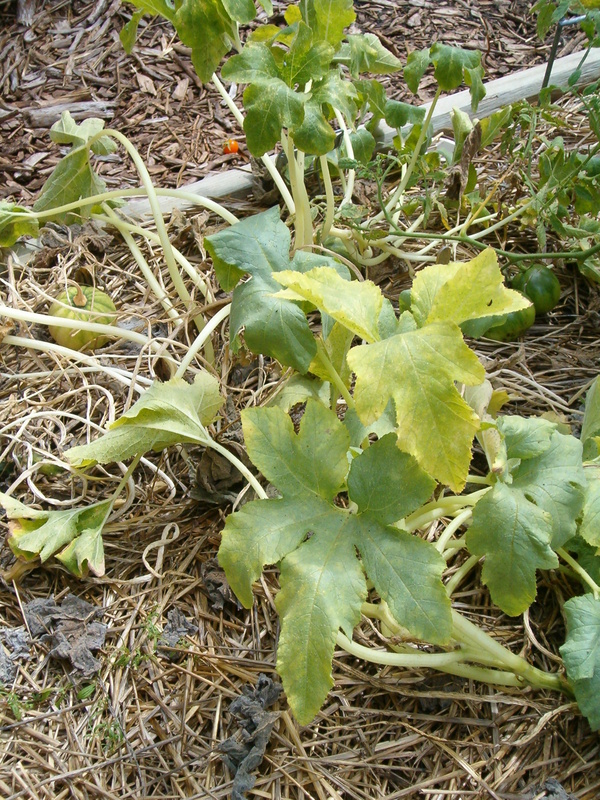 However, one look at the plants tells me that it is not worth the effort to try to keep them alive to produce squash. Don’t you agree with my assessment? The pressure of tons of aphids and spider mites, not to mention those nasty nematodes, is just too much for the poor squash plants to handle. Maybe next year we’ll have better luck! But this year, we’re going to get rid of these plants and find something else to plant for the fall garden. What should we plant? I’m thinking about lettuce, spinach, or maybe some radishes. I will be away from the office (and hence the Demo Garden) all week visiting family in Minnesota and Wisconsin. Posting will be infrequent, if at all. If I find something extraordinary garden-wise on my visits, I may stop by and post those. At the very least, I’ll be back next Monday! The end of another week has arrived! It has definitely been a soggy week, as we measured at least 2″ of rain in the garden. Things are continuing to wind down as the temperatures are a little cooler. It doesn’t bother me, since the spider mites don’t grow as fast in cooler weather either! 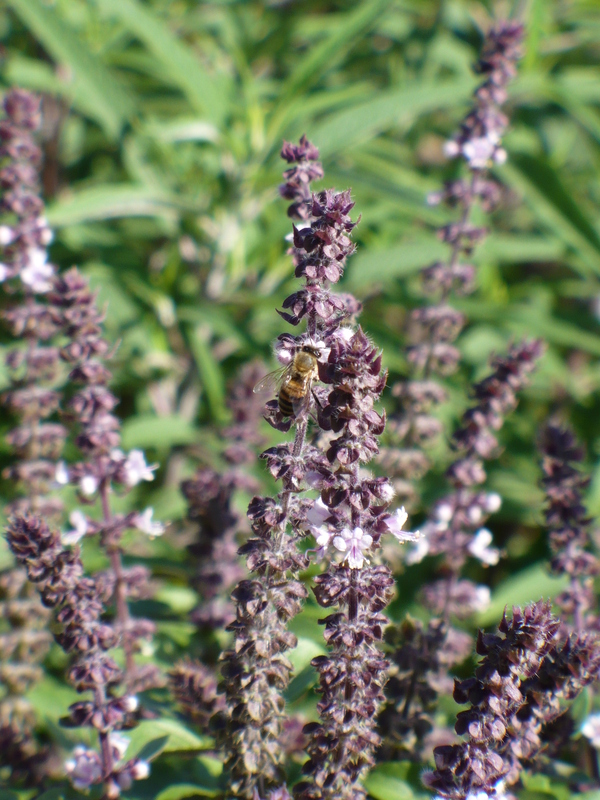 The bees are enjoying this African Blue Basil that is blooming like crazy! For that matter, I’m enjoying it too! I cut a couple stalks for a bouquet on my desk. You know, I had totally written the Purple Russian Roma off, and even condemned it to imminent death. I don’t know if we just assumed the worst of this plant, or if it has decided to shape up in the cooler weather. I’m now also tempted to send a sample to the Plant Pathology Clinic to see if they can culture any fungal pathogens from the plant. Maybe our guess that it has Fusarium Wilt was premature. 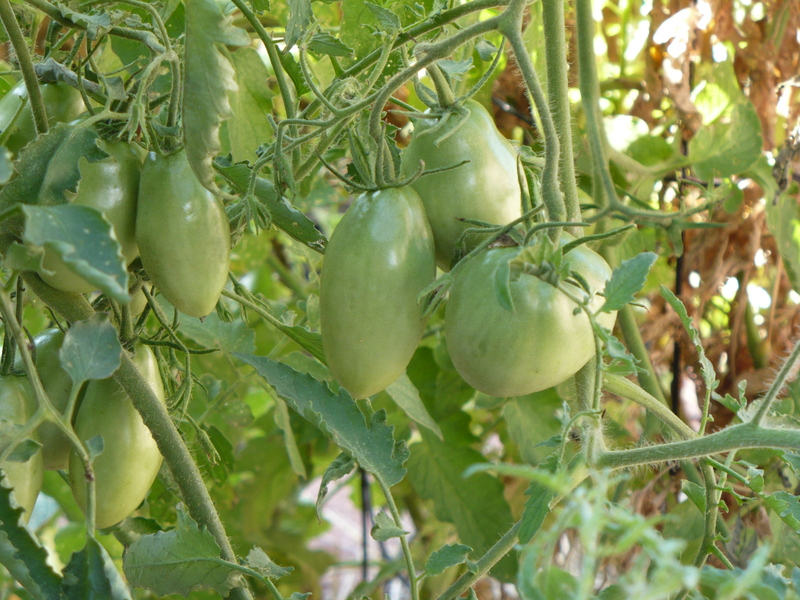 At any rate, there are a bunch of green tomatoes on the plant now! I found a friend on the basil that I cut for my bouquet. 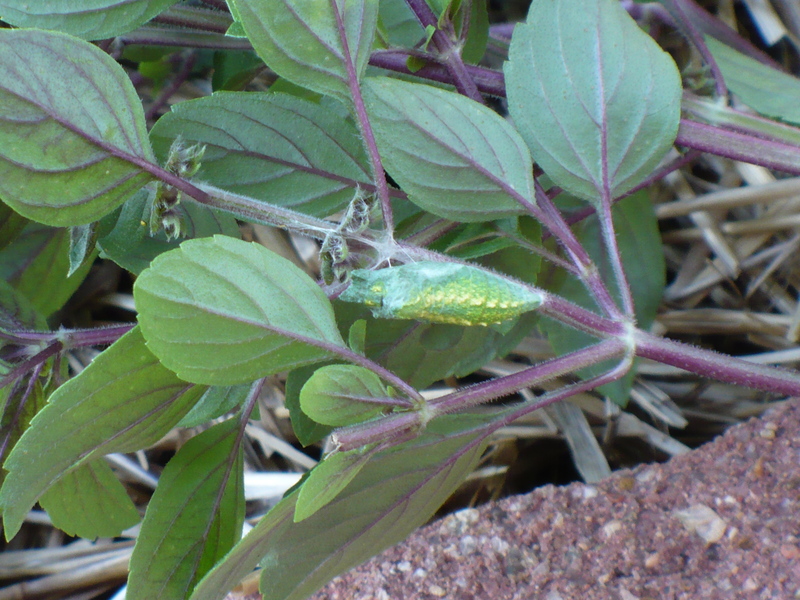 There was this bright green chrysalis on one of the branches. I broke that part of the stem off and tucked it back under the basil plant. Hopefully our marauding robins don’t find it for a snack. 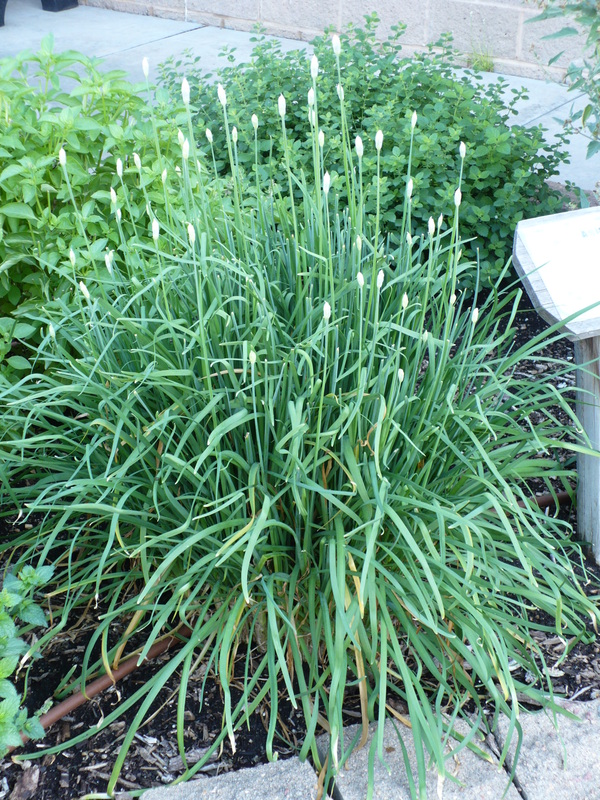 The garlic chives are budding out. If they are allowed to bloom, they will have rather showy, white, round balls of flowers. 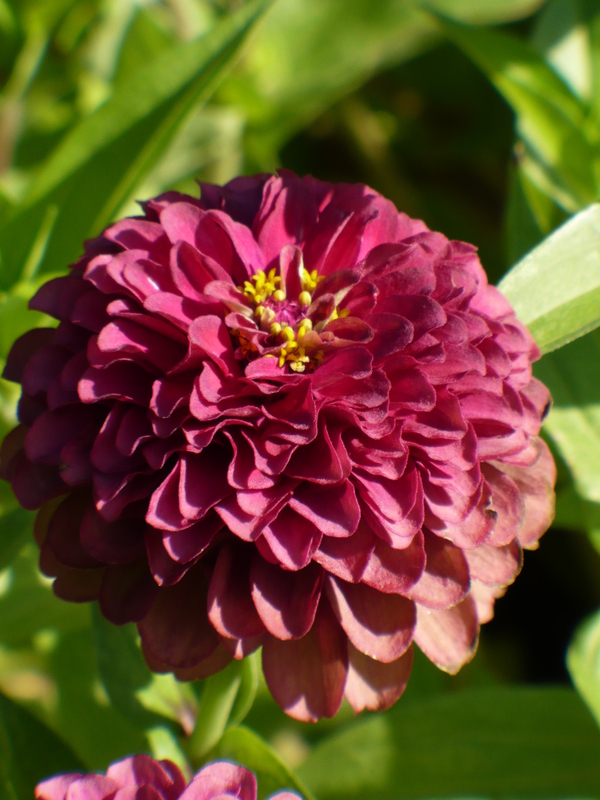 Are you tired of Zinnia pics yet? This is one of the Queen Red Lime flowers. I’m not quite sure what to make of this variety. It was a dusty pink with some green most of the summer, and now it is this bright fuchsia color with no “lime” to speak of. I will admit that I find this one prettier than the dusty colored flowers. A couple years ago, when I was working on a farm, I frequently had excess tomatoes to play with. Although I love growing tomatoes, eating them isn’t my favorite (outside of salsa and tomato sauce, that is). As I was trying to find a way to use up tomatoes in a form that was tasty, I ran across this recipe for Stuffed Tomatoes. I also tried to find the recipe for you, but I don’t remember where it came from, 2 years later. Of course, I didn’t bring my copy from home to type in either! (I guess my blogging grade for the day is “F”!) However, in looking for that recipe, I found lots of other great recipes for stuffed tomatoes, so go find one that fits your tastes! Just briefly, let me give you the run down on my recipe. I cut the tops off the tomatoes and hollowed them out. I chopped the tomato innards for part of the filling. (Later we decided that it would have been smart to scoop out and discard the seeds and locular gel (the goop around the seeds) to keep it from getting too runny.) 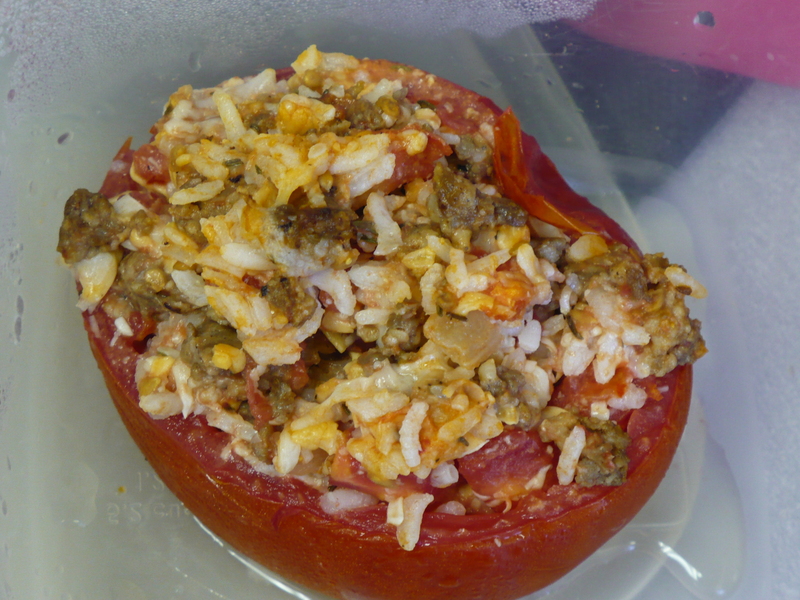 The tomato innards were mixed with 1 cup of cooked rice, some browned sausage, sauteed onion and garlic, oregano, salt & pepper, a cup of shredded cheese, and 1/3 c. grated Parmesan cheese. The tomatoes were stuffed, then popped in the oven for 20 minutes. We chose to eat the “caps” raw, rather than bake them with the rest of the tomatoes. We had to pull one of the squash plants out of the Family of 4 garden yesterday because it was pretty much dead. Sadly, it was our one remaining Bush Delicata squash plant. I had been pretty sure that the problem was just Squash Vine Borers. The plant had sustained some damage earlier, and I thought it was finally succumbing to the damage. When we pulled it up – Surprise! The roots were terribly knobby and twisted. Not at all normal! The roots look like they are severely infested with nematodes. UGH! The nematodes would partially explain why this plant, which had been bearing up well to the onslaught of squash vine borer, all of a sudden started wilting and developing scorched leaves! 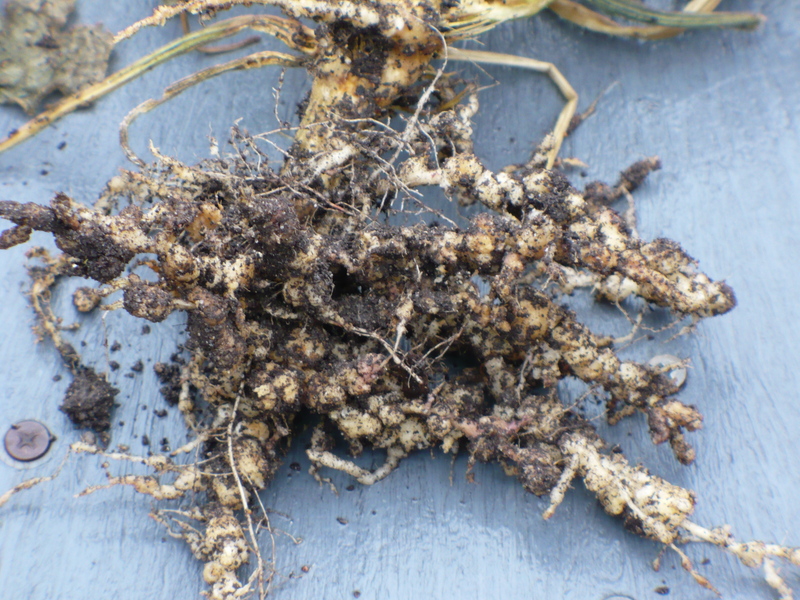 The nematodes were damaging the roots, preventing it from taking up the water it needed. The loss of the squash plant is sad, but what is really making me upset is that this particular raised bed has not had nematode problems before…I wonder where they came from?